The first time I remember being seriously disappointed in a Sonic game was back in 96. I had just spent my hard earned allowance on the newly released Sonic Blast on Game Gear. Just 2 hours after I had spent my hard earned allowance, I had seen everything the game had to show. That disappointment is something that’s continued with the years, and almost become synonymous with the Sonic franchise. It’s what drove me to learn coding, to try making a Sonic game I wasn’t disappointed in. 20 years later, Sonic Mania was released by some similarly disenfranchised fans. Only, Sonic Mania is not just a fan game. It was given the Sega seal of approval, and released to the public as an official Sega game. Told through pantomime, the story starts on Angel Island. We join our heroes, Sonic, Tails, & Knuckles, just as Dr. Eggman stumbles across a mysterious gem, the Phantom Ruby. This Ruby gives the doctor control of space time, and alters his squad of robots, the Hard Boiled Heavies. 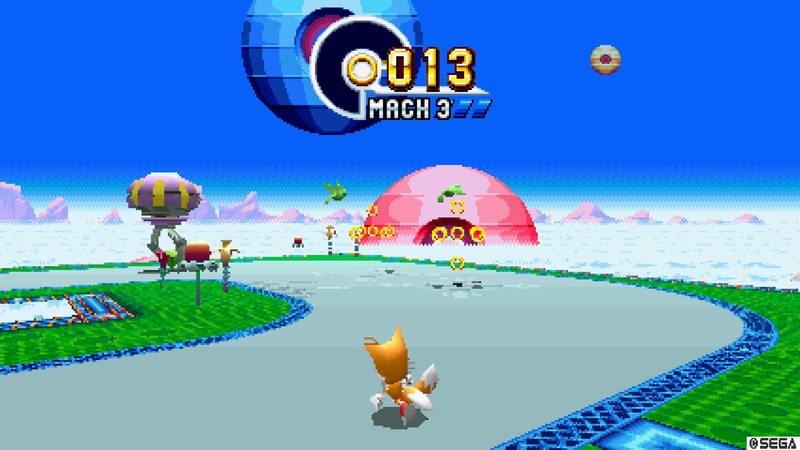 Our heroes must now set out to find all 7 of the Chaos Emeralds, stop the maniacal new Hard Boiled Heavies, and stop Dr. Eggman, all while being warped through space and time to places both familiar and new. The mixing of old and new is something that Sonic Mania revels in. Of the 12 zones, 4 are brand new, and feel almost completely different than anything else in the franchise. 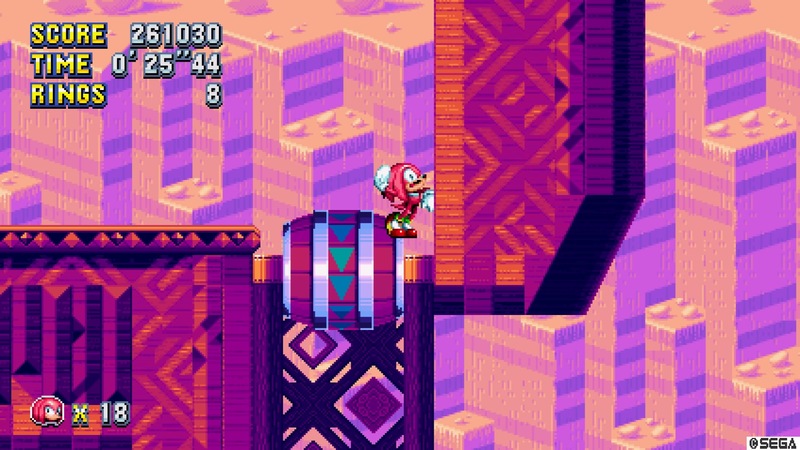 Mirage Saloon Zone is a wink and a nod at Sonic 2‘s cancelled Dust Hill Zone, and Studiopolis Zone gives a new spin on the pinball/casino/cityscape levels of old. Of the remaining 8 zones, 3 are from Sonic 2, 3 more from Sonic 3 & Knuckles, and another 2 from Sonic CD. These remastered zones mostly follow a similar structure; the first act of each contains layouts and level elements from the game of origin, albeit drastically increased in scale and scope. These first acts are a fantastic way to expand upon the originals. It almost feels like the original acts were cut short, and we’re finally seeing these locations in whole. After fighting an Act 1 mid-boss (most of which are unique for the series, not rehashes), you’ll speed directly into Act 2, which not only feature fantastic music remixes of the traditional themes, but introduce mechanics both new and old. In a water level? 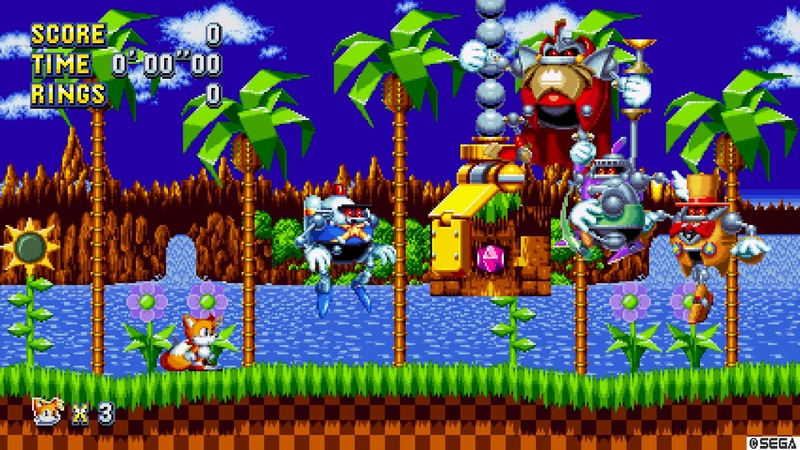 You better expect to see enemies from across the water levels seen throughout the series, as well as mechanics from both the Genesis and Game Gear games. This structure leads to a pleasing mix of new and old for fans of the series. However, if you weren’t a “Sega Kid” back in the ’90s or you’ve never played a Sonic game, this praise of nostalgia might be off putting. For new inductees to the franchise, the mechanics can be explained as a mix of speed and lack of control. Sonic and friends are at their fastest when the player relinquishes control and allows physics to take over. However, playing too lose leads to lost rings or worse, lost lives. As such, first playthoughs are about learning the level, taking your time through the almost metroidvania-esque stages. Subsequent playthoughs feed off the speed runner in all of us; each playthrough affirming that with confidence and skill comes better times and better scores. This point is reinforced by the character movements. As fast as Sonic and company are, their build up to speed is slow and methodical, with momentum and buildup guiding their actions. Sonic is all about finding that point between unhinged speed and lack of control, and maintaining that balance to reach your goal as quickly as possible. 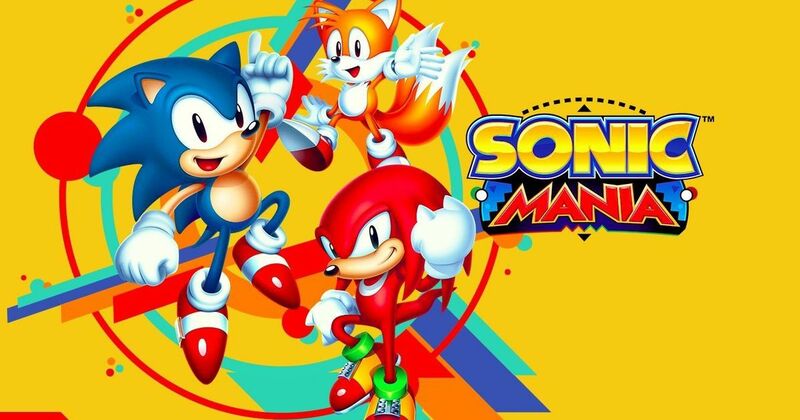 In that sense Sonic Mania is the first game in 20 years to tap into that manic nature that made the originals so popular. The only things that might make this unapproachable by new comers is Mania‘s need to flaunt Sonic‘s franchise history. At least one boss felt a little obtuse, with mechanics taken from a Genesis, Sega CD, and Game Gear game. Cameos and easter eggs will also be lost on newcomers. However, besides the one possibly frustrating boss, Sonic Mania is an amazing look at why this franchise was loved by so many. Even with no prior experience, Mania is a worthy entry point into the series. My only other real complaint with the game is the ending achieved by collecting all 7 Emeralds. Almost none of the expected catharsis was found upon completing the game with all of these collectibles, but that’s a minor stumble at the finish line for an experience that was pulled off perfectly otherwise. With 24 Acts, 25 bosses, 7 special stages, 32 bonus stages, 3 unique playable characters, and tons of unlockables, Sonic Mania‘s modest 4-6 hour play time for a single playthrough is forgivable. Designed to keep you coming back, I’m almost thankful it doesn’t take longer to complete. Sonic Mania is a love letter to longtime fans, but that doesn’t mean it can’t be appreciated by new comers. For me, this is the game I’ve waited 20 years for, and I’ve enjoyed every minute I’ve played of it. If Sonic Mania is the future of the franchise, this is a step in the right direction. And with as fast as Sonic runs, I hope this leads to many more steps like this in the future. A software engineer with a love of graphics programming, Tom spends his days coding and dissecting games just as much as playing them.